My kids think these barbeque pork sandwiches are better than those at a local BBQ restaurant, I'll let you be the judge. This recipe calls for an inexpensive bone in pork shoulder. In the picture on the right you can see the shoulder, which has a spice rub on it, being browned before going in the slow cooker. Because of the shape of this piece of meat, this recipe works best cooked in an oval shaped slow cooker. If you don't have this type of slow cooker, you can either follow the directions below for an oven cooking method, or check out the recipe for Slow Cooker Pulled Pork Sandwiches which calls utilizes a pork tenderloin that could be cut into smaller pieces if you are using a round slow cooker. Place roast in a large non-stick skillet. Mix together the paprika, black pepper, and onion powder. Pour this spice mixture over both sides of the roast, and either pat the spices into the meat with your hands or with the back of a spoon. 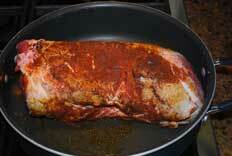 Brown the meat over medium-low for 1-2 minutes on each side, being careful not to burn the spices. If you are using a non-stick pan, no oil will be necessary. Transfer the browned meat into a slow cooker. In the same pan, pour the beer and 1 cup of the barbecue sauce in the pan. Cook over medium heat, stirring until blended and the mixture comes to a boil. Pour this liquid over the meat in the slow cooker. Cover the slow cooker and cook on low for 8-10 hours, or on high for 5-6 hours. When cooking time is complete, remove meat and scrape off any fat. Remove and reserve 1 cup of the sauce from the slow cooker. I like to put the reserved sauce in the freezer for 5-10 minutes so the fat rises to the top and can be removed. Shred the meat using two forks. Transfer the shredded meat back into the slow cooker along with the 1 cup of reserved and defatted cooking liquid and 1 cup of additional barbeque sauce. Stir well and serve on hamburger buns or kaiser rolls. Yield: approximately 10-12 sandwiches and leftovers freeze well. Cook's Notes If you don't have a slow cooker, you can prep the roast in the same manner and place the browned roast along with the beer and bbq sauce mixture in a large covered baking dish and bake at 350'F for 3-4 hours, or about 30 minutes per pound, reaching an internal temperature of 165'F.